Satellite TV and free landline nationwide phone calls. Free calls to Canada too!. 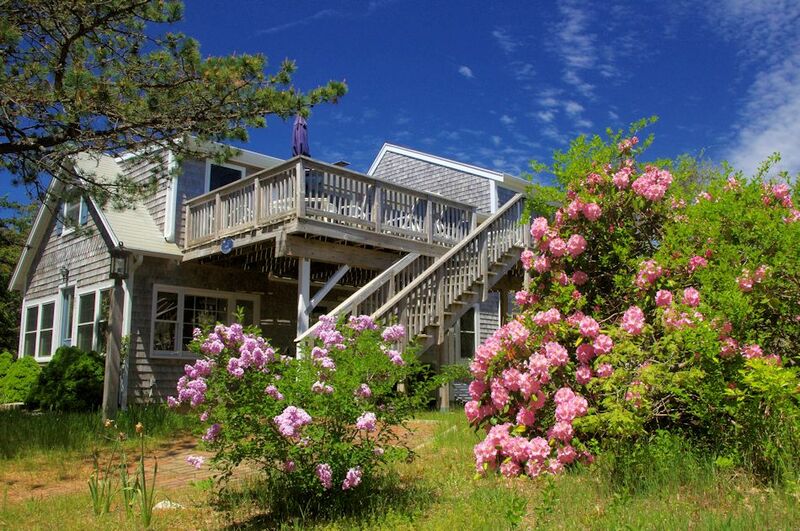 Located at 85 Rockwell Ave. in South Wellfleet, MA, this 6 bedroom, 3.5 bath house is located on a quiet, unpaved road that leads to the ocean beach at LeCount Hollow in South Wellfleet, MA in the Cape Cod National Seashore. This beach is also known as "Maguire's Landing." Offering 2,660 sq. ft.this home has plenty of room for one large family or for 2 families to share. The owners of this vacation home named it "The Unwinder" because everything about it invites you to relax. The best thing about this home is the fact that it is close to everything but away from the busy state highway. A newly renovated kitchen, with all stainless appliances, granite countertops and hardwood floors, make for carefree living. This house has 3 TV sets and Comcast Wi-fi Internet access. Three bedrooms are located on the first floor and 3 bedrooms are on the upstairs level. The first floor level also has a living room with TV, laundry and access to the outdoor shower. The upper level of the house has two bedrooms at one end. One of these is the master bedroom with TV ensuite bath and a private deck. The 3rd upstairs bedroom, located at the other end of the house, has two twin beds and is off of the dining area. In the center section of the upstairs is the new kitchen, a dining area with access to the main deck, a staircase to the lower level and a 3rd television viewing area. The kitchen has a drip coffee maker with filters as well as a coffeemaker that takes "Nespresso" pods (Kureg won't fit). LeCount Hollow beach has lifeguards from the third weekend in June until Labor Day. To begin the reservation process, click on the "Reservation Request" button on this page and complete the form at the bottom of the next page that appears. We will then contact you details of your reservation request. You will then need to reply to us again before we can hold the cottage for you. Map and Directions to The Unwinder at 85 Rockwell Ave.
Click on this button to begin the reservation request process.